Jalandhar: Maintaining annual LPU tradition of awarding meritorious & talented students of the university; Lovely Professional University organised 5th 'University Honour Ceremony' for recognizing students’ excellent achievements identified during last one year. 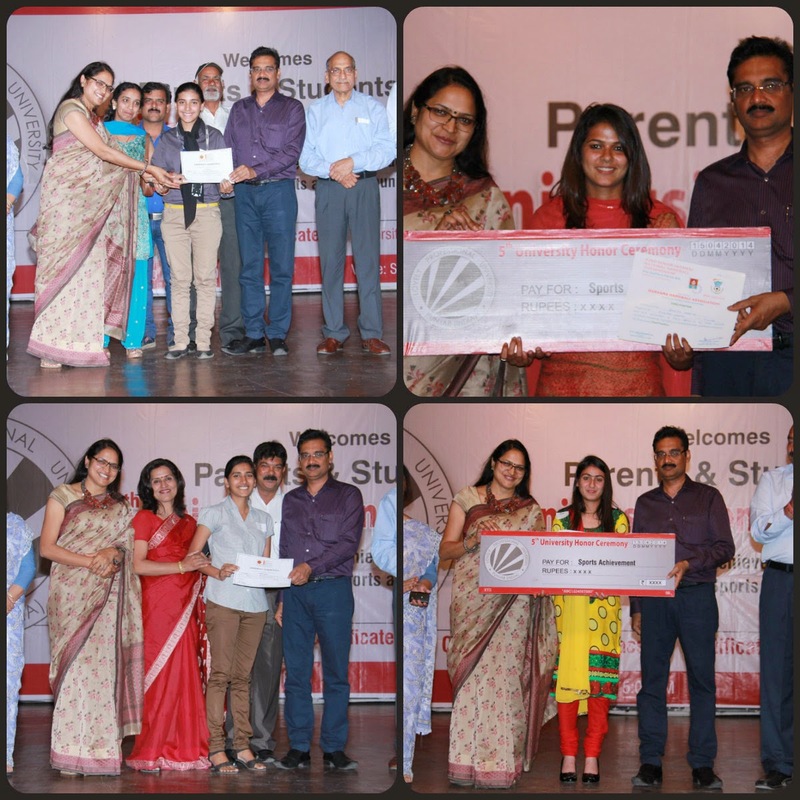 A total of 175 students, who are achievers of excellence in academics, sports, cultural & community service activities, were honoured with cash prizes worth Rs 26 lakh. Rs 18.15 lakh and Rolls of Honour were awarded to sports and academic achievers; and, near Rs 8 lakh were given to achievers in cultural and community service activities. Most of the achievers included those students who won medals in national/zonal/state level events held in collaboration with Association of Indian Universities and the Ministry of Youth Affairs and Sports. One of the sports women, Madhavi Sharma a B.PEd student received maximum cash prize of Rs 1,17,500 for winning 4 gold, one silver & 2 bronze medals at national, zonal and state level competitions for Baseball and Softball. Similarly, Inderbir Singh (M.Sc. Food Tech.) & Gurpreet Singh (B.PEd) received Rs 1,10,000 each for winning many gold medals. Ajay Tiwari (B.Tech CE) & Muni (B.PEd) got top cash prizes of almost one lakh for their excellent performances in many cultural activities like Western Group Song, Classical Instrumental, Dance. Jubilant Madhavi exclaimed: "I am indeed very happy! This honour means much to me. When I informed my parents about the prize money, since then they are excited to personally thank my mentors at the university who always guided me so well.” Inderbir Singh also praised the efforts of his teachers: “In spite of my being a student of a professional program of sciences, my teachers not only identified my love for sports but they motivated me to participate in different competitions. They accorded patronage to me for letting me develop my inborn talents." Mr Sukhpal Singh father of another prize winning student Renu Chaudhary (M.Tech CSE) holds that he feels grateful to university for personality growth of his daughter through such time to time encouragements. I really enjoyed over read your blog. Your blog contain valuable things, I got good thoughts from this amazing blog. I am all the time searching like this kind blog post. I expect I will see again. This is an inspiring post review. I am so pleased to get this post and nice information. I was looking further to get such a post which is extremely helpful to us. A big thank for posting this blog in this website. Students are the future leaders of any nation so they must be mind and groomed to be best citizen by parents, teachers, coaches and a big section of the society. It does not denote that they might be spoiling and no remedial action must be full against their wrong behaviors; but we must find the reason and attempt to put right it previous to imposing our say on them. The majority of the time teachers, parents and society at big want to bring best out of the best students but in their own method. But in this mission sometimes they do them hurt. Every human being has own life lecture and this is true of every students. Students must show that they are prepared to work tough – that they’re not just applying to university for the community life, but that they will be capable to manage with the workloads of their selected course and succeed at a higher level of best education. As well as good quality grades, students can express this in their personal speech by mentioning their comprehensive essay or individual projects they have taken on to increase their knowledge or learn skills. Linking this to their future area of university learns is helpful. Showing the aptitude to run your time and workload is important, too. Once again thank you for the post. View at cheap essay writing services is a top online essay writing service. And are packed with expert and experienced essay writers. This provides best essays at an affordable rate to students. If you need argumentative essay writing guidance, see this website right now, fellows!